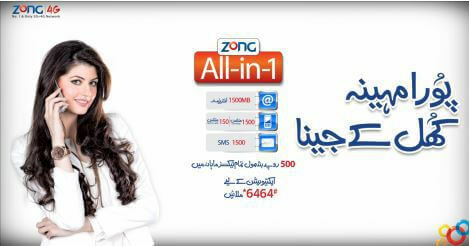 Zong is best network among the all networks in Pakistan. It always introduces different and unique packages for its prepaid value customers. It gives you the best value of your money by providing exciting and reasonable offers. If you love to talk with your friends and family for long hours then you should use zong all–in-1 bundles. In which you will get a chance to talk and chat with your friends on daily, weekly and monthly basis. You will get all SMS and calling facility in one bundle. It is your choice to avail this offer for 7 days or 30 days basis. If we discuss about the reliability of this network signals then you must be happy to know that you will get perfect fine signals regardless, where you are and what was the weather. It is only network, who think about the comfort of its users that’s why it always launch reasonable and affordable rates packages for its customers so that any normal person can utilize its outstanding and reliable packages. So, doesn’t waste time and subscribe All-in-1 bundles of zong now. It is said that if you have reliable and active signal network with unlimited call package then the long distances relation doesn’t matter. You can also use facebook and other application easily. If you want to utilize, this amazing facility of chatting, calling and messages then choice your bundle from the following and relish your life by connecting with your friends and family members. Monthly: to subscribe for monthly bundle it is depend on price like if you want monthly 250Rs. then dial *6464#>3>3 and for monthly 500rs then dial *6464#>3>4 and for monthly 599Rs. then *6464#>3>5 and for monthly 700Rs. dial *6464#>3>6. Monthly: In monthly bundle, you can get free call SMS and MB in 250 Rs., 500rs, 599 Rs and 700 Rs plus tax. Daily: You will get 40MBs data, 400SMS, 40 minutes on-net and 4 minutes off-net. Monthly: You will get 700MBs, 700 on-net minutes, 70 off-net minutes and 700SMS in 250rsmonthly. You will get 1500MBs, 1500 on-net minutes, 150 off-net minutes and 1500SMS in 500rs monthly. You will get 2GB, unlimited on-net minutes for 24 hours and unlimited SMS for 24 hours in monthly 599. You will get 4GB, unlimited on-net minutes for 24 hours and unlimited SMS for 24 hours in monthly 700. It will be automatically UN-subscribe as the duration of packing is over. The offer can be subscribe by dialing *6464# required bundle number. Validity for daily, weekly and monthly is 24hours, 7days, 30days. You can check your remaining minutes, SMS by simply dialing *111#.